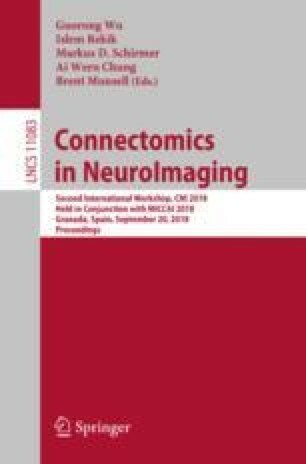 Morphometric similarity networks (MSNs) have been recently proposed as a novel, robust, and biologically plausible approach to generate structural connectomes from neuroimaging data. In this work, we apply this method to multi-centre neonatal data (postmenstrual age range: 37–45 weeks) to predict brain dysmaturation in preterm infants. To achieve this goal, we combined different imaging sequences (diffusion and structural MRI) to extract a set of metrics from cortical and subcortical brain regions (e.g. regional volumes, diffusion tensor metrics, neurite orientation dispersion and density imaging features) which were used to construct a similarity network. A regression model was then trained to predict postmenstrual age at the time of scanning from inter-regional connections. Finally, to quantify brain maturation, the Relative Brain Network Maturation Index (RBNMI) was computed as the difference between predicted and actual age. The model predicted chronological age with a mean absolute error of 0.88 (±0.63) weeks, and it consistently predicted preterm infants to have a lower RBNMI than term infants. We conclude that MSNs derived from multimodal imaging predict chronological brain development accurately, and provide a data-driven approach for defining cerebral dysmaturation associated with preterm birth. The online version of this chapter ( https://doi.org/10.1007/978-3-030-00755-3_6) contains supplementary material, which is available to authorized users. P. Galdi and M. Blesa—These authors contributed equally to the work. We are grateful to the families who consented to take part in the study. This work was supported by Theirworld (www.theirworld.org) and was undertaken in the MRC Centre for Reproductive Health, which is funded by MRC Centre Grant (MRC G1002033). MJT was supported by NHS Lothian Research and Development Office. Participants were scanned in the University of Edinburgh Imaging Research MRI Facility at the Royal Infirmary of Edinburgh which was established with funding from The Wellcome Trust, Dunhill Medical Trust, Edinburgh and Lothians Research Foundation, Theirworld, The Muir Maxwell Trust and many other sources; we thank the University’s Imaging Research staff for providing the infant scanning. Part of the results were obtained using data made available from the Developing Human Connectome Project (King’s College London - Imperial College London - Oxford University dHCP Consortium) funded by the European Research Council under the European Union’s Seventh Framework Programme (FP/2007–2013)/ERC Grant Agreement no. 319456.